Edmonton: Beartrap Publishing, 1980. 62 pp. With forward written by Percy Wickman, an Edmonton alderman confined to a wheelchair. Due to a vehicle accident Ed Brennan was confined to a wheelchair. A collection of poems (some prose). Softcover has very little wear, clean and bright. No former owner's name. Text is clean. Last page has had a coupon clipped from it.. Soft Cover. V. Good. 8 x 4 1/4. Toronto: Summerhill Press/Woodland Press, 1987. 100 pp. A book of poetry by Ruth Churchill Peppler accented with the wonderful photography of Jim Ford. Foreword by Hagood Hardy. Poems of Spring, Summer, Autumn and Winter that reflect the moods, beauty, and changes of life. A wonderful collection and a beautiful book. Photographic notes. Dj has one tear (3/4") but is otherwise very good and looks good in new mylar cover. Not price clipped. Royal Blue binding has wee bumps to corners and top and bottom of spine. No former owner's name on endpapers. Text is lovely, clean, unmarked. DJ cond: good-v. good Book cond: v. good++. HC and DJ. 9 x 8 1/4. Cleveland and New York: The World Publishing Company, 1957. 248 pp + title index+ index of first lines. This wonderful collection of story poems includes: Jesse James by William Rose Benet; The Mountain Whippoorwill by STephen Vincent Benet; Matilda by Hilaire Belloc; The Dog's Cold Nose by Arthur Gutterman; The Spelling Bee of Angels by Bret Harte; Molly Means by Margaret Walker; The Cremation of Sam McGee by Robert W. Service; many more. Dj has chips from top edge and spine bottom but front illustration, title and author's name intact. Editor's b/w photo on rear dj. Not price clipped. Looks good and held nicely by new mylar cover. Turquoise colored cloth on boards binding has bumps to top corner. Clean. Rust colored lettering and front illustration. A bit of foxing on endpapers but no former owner's name. Text is clean, tight and unmarked. B/w line illustrations throughout. DJ cond: poor-fair. Book condition: good.. First Edition. HC and DJ. Illus. by Walter Huehr. 8 1/2 x 5 7/8. Philadelphia, N.Y.: J. B. Lippincott Co., 1961. 63 pp. A delightful collection of children's poetry illustrated by b/w sketches. The looks on the children's faces are priceless. "Someone's face was all frowned shut,/All squeezed full of grims and crinkles,/Pouts and scowls and gloomers, but/I could see behind the wrinkles--" Although this is a library book it is in nice condition \. The red paper on boards binding with yellow spine has bumping to the corners and top and bottom of spine. Endpapers have former owner's name. School stamp on title page and inside back cover. Pocket has been neatly removed. No date due paper. Text is clean and unmarked. No corner folds. A good copy.. Presumed First. Hard Cover. Illus. by Edward Gorey. 9 7/8 x 6 3/4. Ex-Library. Calgary, Alberta: Red Deer Press, 2001. 72 pages. An poetic exploration of the imagination of Brazil. ".the interplay between the stories of history and the silence of the dispossed." Softcover has very min wear. Signed by author on title page. Text is very clean and unmarked. A great copy.. Signed by Author. Presumed First. Soft Cover. Very Good - Near Fine. 4 x 7. New York, NY, U.S.A.: Morrow/Avon, 1974. 63 pp. Index of first lines. 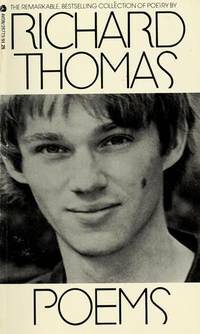 "In this selection, he reveals the life of a young poet, a man in love, a private person on a public stage, and a being grasping meaning to a short span of life." Cover has a faint creasing to bottom front corner. No former owner's name. Text is very clean and unmarked. No corner folds.. First Avon Printing. Soft Cover. Good. 7 x 4 1/4. Le Cercle Du Livre De France, 1964. 159 pp. Poetry . B/W line illustrations. Pages are uncut. Softcover has some bumping to corners and a wee bit of edgewear. Glued cover is coming loose at spine but could be easily reglued. Obviously never read. No former owner's name.. Soft Cover. Good. Illus. by Jean Landry. 8 x 5 3/4. N.Y.: Congdon & Lattes, 1981. Prose and poetry about hares accented with beautifull illustrations and paintings by such artists as Albrecht Durer, Arthur Rackham, Kit Williams. Dustjacket in lovely condition, very min signs of wear. Not price clipped. No former owner's name. Text is clean and unmarked. A great copy. Dj cond: v. good-near fine. Book cond: v. good - near fine.. First American Edition. HC and DJ. 6 x 4. New York and London: Whittlesey House, 1942. 502 pp. + index of authors, title, and first lines. A collection of light verse. Categories of: Burlesgue/parody; Innocent merriment; Love, etc; Nonsense; Panegyric; Satire; Song and Story; Sport; Translation/Paraphrase. Well-known and not so well known poets. Green cloth on boards cover has wee rubs to corners, clean , gold gilt lettering. No former owner's name on endpapers; clean Text is clean, tight and unmarked. Overall cond: v. good.. Third Printing. Hard Cover. 9 1/4 x 6 1/2. 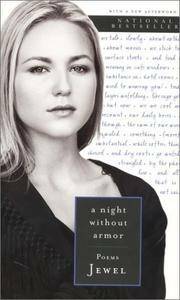 Toronto, ON, Canada: HarperCollins Canada, Limited, 1999, 1999. Soft Cover. First Paperback Edition. 9 1/8 x 5 1/2. ISBN:0-06-107362-8. 140 pp. Singer, entertainer, Jewel, first published a hardcover edition of her poems in 1998. This softcover edition has fold-ov er cover with flaps (price uncut), and a new autobiographical afterword. Her poems are beautiful - many of them about Alaska, where she was born and lived as a child - Alaska's beauty and other images of bards, the road, the lessons of betrayal "I've learned that not all poetry lends itself to music - some thoughts need to be sung only against the silence", she states in the preface. This copy in new condition - unblemished in any way. Bright, tight and clean as if just taken from the book shop's shelf. Gorgeous illustrations by the brilliant artist, Pat Steir. b/w photos of Jewel on front and back cover. An outstanding collection of poems. Overall cond: fine..
New York, NY, U.S.A.: Simon & Schuster Trade, 1976. 53 pp. A wonderful book of poetry by one of America's favorite authors. ".let her help you take a look at that decade of sagging knewwcaps and college reunions and fantasies of love in the afternoon." Dj has a little wear to edges and some scuffing to edges. Price clipped. New mylar cover. Ecru paper on boards binding with green lettering and illustration is in good condition, slight bump to bottom of spine. Great green illustrated endpapers have no marked, no former owner's name. Text is green printing on ecru paper. 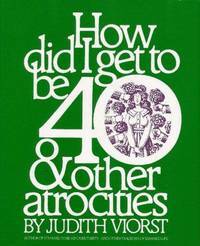 A good copy of this witty book for middle agers.. First Edition. HC and DJ. Very Good/Good. 7 7/8 x 6 1/4. Mount Vernon, N. Y.: The Peter Pauper Press This wee book rendered into English Verse by Edward Fitzgerald. Wonderful red and gold block print type illustrations with decorative borders in red and white on top and bottom of gold background text. Book has very little noticeable wear. A great copy.. HC and DJ. Near Fine/Near Fine. Illus. by Jeff Hill. 7 1/2 x 4 1/2. Markham, Ontario: Puffin, 1989. 131 pp. 110 poems by children across Canada. The result of a nationwide poetry contest conducted in 1988. "There's nuffin like a muffin." Softcover has a crease to bottom front corner and a faint crease from holding. Former owner's stamp inside front cover. Text is clean and unmarked.. First Edition. Mass Market Paperback. Good -. City Limits Communications Soft Cover. 8 1/2 x 5 1/2. 80 pp. A collection of poems reflecting life in the seventies. Perhaps you will see yourself in this poetry. Canadian author. Softcover is in excellent cond: No former owner 's name. Text is very clean. Overall cond: near fine..
N.Y.: Alfred A Knopf, 1960 HC and DJ. 34th. 9 1/2 x 6 1/2. 43 pp. A remarkable diary in verse; Walter Benton's first published volume of poetry. First pub in 1943. This is the lovely 1960 printing,set on the Linotype in Bodoni Book, a printing -type so called after Giambattista Bodoni, a celebrated printer and type desiner of rome and Parma (1740 - 1813). This book was composed, printed, and bound by H. Wolff. Typographic a nd binding design by W.A. Dwiggins. DJ has tears, creases and chips; rear dj has dust soiling. Not faded; not price clipped. Binding is tight, bright, and clean. Endpapers are pristine - no former ow n er's name. Pages are bright - no tears, chips or creases. In spite of flaws to dj this is a nice copy of Benton's passionate love poetry. Dj: fair-good Binding: v. good. Endpapers and text: v. good..
Toronto, ON, Canada: Wolsak & Wynn Publishers, Limited, 1995. 71 pp.A collection of poetry that "tests the limits of its own imagery and lyricism while faithfully tracing a narrative of expectant fatherhood." .part confession, part play, part rage. Softcover has tiny bump to front cover bottom - in very clean, unmarked cond. Text is very clean and secure, No former owner's name. A great collection from this Canadian poet.. Soft Cover. 8 3/4 x 5 3/4. Boulder, CO, U.S.A.: Blue Mountain Arts (R) by SPS Studios, Incorporated, 1973. 61 pp. 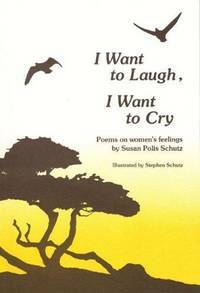 Poems on women's feelings. Softcover has very little wear. No creases or tears. Gift inscription to former owner on first page. Text is very clean, secure and unmarked. A good copy of Susan Polis Schutz heartfelt sentiments.. Soft Cover. Good +. Illus. by Shutz, Stephen (illustrator). 8 1/2 X6. The C. R. Gibson Co. , 1976. Hard Cover. Presumed First. 8 1/4 x 6 1/4. Poems for Dads and Grandads everywhere. Heartwarming line illustrations tinted with green. Contents in four parts: The Little stranger, Earn and learn, All i n the Family, Chin up, Grandad. Endpapers have hand in hand father/son illustration. Illustrated paper on boards cover has very min rubbing at corners and a bit of fading on spine. gift inscription to former owner on front free title page. Text is very clean, secure and unmarked. Overall cond: v. good.. Hardcover. Used - Good.